A mother and her child among the rescued. 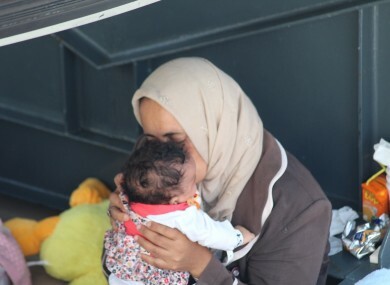 MEMBERS OF THE Defence Forces revived five people, including a baby, who were rescued in the Mediterranean yesterday. A number of pregnant women and new mothers are among the now record 712 people currently aboard the naval vessel. Commander Brian Fitzgerald said that while some of those saved are in a “wretched condition”, the work of his team meant that all 712 survived and there was no loss of life. Speaking on Morning Ireland, Fitzgerald said he was extremely proud of the team on the LÉ Eithne. Commander Fitzgerald also added that there are currently 14 pregnant women on board, three of whom are over eight months pregnant. The LÉ Eithne was deployed to the Mediterranean on 23 May 2017, as part of the government’s response to the refugee crisis. The Irish navy’s role is to provide a search and rescue capability and undertake humanitarian rescue operations at sea. Email “Irish Navy revives infant found unconscious in Mediterranean as record numbers saved ”. Feedback on “Irish Navy revives infant found unconscious in Mediterranean as record numbers saved ”.